Spin these reels to travel back to ancient Egypt during the legendary reign of King Tut. Click here to play! You'll have the chance to discover treasures beyond belief in this Egyptian adventure. 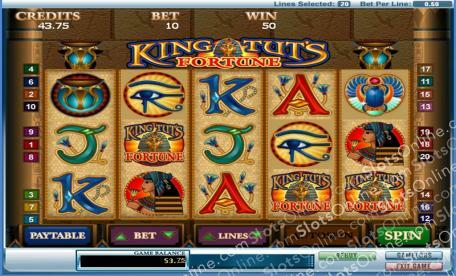 As you're in search of King Tut's Fortune, you'll definitely want to spin the King Tut logo. This wild symbol will not only substitute for selected other symbols to help you create more wins, but it will also bring in up to 2500 times your line bet. It you can spin Tut's Egyptian Queen one to five times across an active pay line, you'll get up to 1000 times your line bet. There are plenty of other symbols to help you unearth Tut's treasure, including hieroglyphics in the forms of A, K, Q, J, 10 and 9. It wouldn't be an Egyptian adventure without jeweled Scarabs, Falcons and Egyptian eyes. Spin three or more of any of these three symbols and you will trigger a bonus feature that will see you winning even more cash prizes. There is also the scatter fire torch symbol. Spin it on selected reels and you'll trigger a number of free spins. So, spin these reels for a chance to travel back in time to capture King Tut's Fortune! The Fire torch symbols with golden snakes acts as a scatter symbol. Spin it on reels 1 and 5 and you will trigger up to 12 free spins. The King Tut's Fortune logo is a wild symbol. It will replace the Egyptian Queen and A symbols to help you create more winning lines. If you can spin one to five logos across an active pay line, you will win up to 2500 times your line bet. Jeweled Scarabs, Falcons or Egyptian eyes will trigger King Tut's Bonus if you spin three or more of any of them anywhere on the board. During this game you will have to choose from a selection of locks. Your first selection will reveal a symbol and give you a 3x multiplier, for every matching symbol that you choose on subsequent picks, you will raisey our multiplier. You can win up to 100x your total bet.